If you suspect rats in the attic or roof of your Austin property, call Magic Pest and Lawn for roof rat control before your rat problem becomes a nightmare. Our rat removal professionals are experts at getting rid of roof rats efficiently, using the safest and most efficient roof rat control methods. Roof rats are also called black rats, ship rats, house rats, Alexandrine rats, or white/gray bellied rats. No matter what you call this pesky black rat, you want to make sure you hire the industry-leading rodent control professionals to get rid of roof rats in your home or business before they cause major structural damage, leave a mess of rat droppings, chew through woodwork, and most importantly, bring dangerous diseases into your home. How Do I Detect Rats in My Attic or Roof? 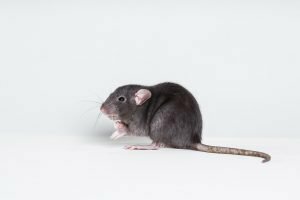 Scratching noises in walls, ceiling, or attic: If you hear strange scratching in the ceiling or walls, especially at night, you might have a roof rat problem. Black rats are incredibly active in the evening hours, and can make noise as they hunt and hoard food at night. Roof rat droppings: Black rat droppings are 1/2 inches long with pointed ends, and found in small piles. Rat droppings in your home are the most common and obvious sign of a house rat infestation and indicate that you should call your rodent and rat control professionals at Magic Pest to prevent roof rat problems from getting out of hand! Small teeth marks or scratches: If you notice scratches or bite marks on woodwork and baseboards; holes or chewed areas in your cardboard food containers or bags of seed and pet food; or tiny footprints and greasy trail marks around your walls and in dusty areas, it might be signs you need to call the roof rat control experts at Magic Pest and Lawn. Roof rats breed quickly and often. A standard black rat litter can have up to 8 babies, and a female roof rat can produce up to 40 babies in her lifespan. That means it’s imperative to get professional roof rat control services from Magic Pest and Lawn’s pest control teams before your rat infestation gets out of control. Due to their adaptability and agility, getting rid of roof rats can be a difficult task. Our rodent removal methods are innovative, safe, and cost-effective for your Austin household. A roof rat is also called the black rat, the grey-bellied rat, or the white-bellied rat because of its smooth, dark back/brown fur and light-toned underside. Their tails are longer than their bodies, and have a hairless scaly texture. Roof rats have large ears and eyes in relation to their bodies and a pointed nose. Roof Rat Size: The common roof rat, or ship rat, is generally 10-12 inches long (excluding tail) and weigh between ¼ to ¾ of a pound. Roof Rat Habitat: Roof rats can be found in nests on the ground, however, they are avid climbers and prefer elevated areas, such as trees, when they are in the wild. However, in your home, roof rats often nest in areas such as attics, rafters, ceilings, chimneys, and, as their name implies, your roof. Inside your Austin home, they can be found nesting in attic insulation or areas that are warm, and preferably near a food source. Black rats enjoy fruit primarily, but also eat veggies, seeds, nuts, grains, and other insects. What’s the Difference Between a Norway Rat and a Roof Rat? If you suspect you have rats in the attic, ceiling, or roof, don’t let a rat infestation grow from a minor annoyance into a major pest problem. Contact the roof rat control team at Magic Pest and Lawn today and take back your Austin home or office!